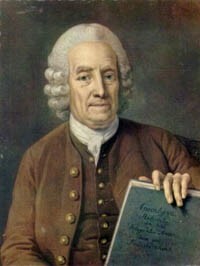 Emanuel Swedenborg was a Swedish mystic and scientist, who, early in his career, wrote books on mathematics, navigation, astronomy, chemistry, and mineralogy, and formulated a version of the nebular hypothesis, though this received little attention at the time. He then became convinced, through a series of strange dreams in 1743–45, that he had been contacted by spirits who described to him the existence of countless inhabited worlds. In his Heavenly Arcana he describes a visionary trip to the planets and recounts being told that on Venus there were two races, one gentle and humane, the other savage and cruel, while on Mars lived the noblest creatures in the solar system, resembling in piety the early Christians. Thereafter, Swedenborg devoted his life to expounding his revelations in works such as The New Jerusalem (1758).